At twenty-one-years-old, Lily Brooks-Dalton is feeling lost; returning to New England after three and a half years traveling overseas, she finds herself unsettled, unattached, and without the drive to move forward. When a friend mentions buying a motorcycle, Brooks-Dalton is intrigued and inspired. Before long she is diving headlong into the world of gearheads, reconsidering her surroundings through the visor of a motorcycle helmet, and beginning a study of motion that will help her understand her own trajectory. Her love for these powerful machines starts as a diversion, but as she continues riding and maintaining her own motorcycles, she rediscovers herself, her history, and her momentum. Forced to confront her limitations—new and old, real and imagined—Brooks-Dalton learns focus, patience, and how to navigate life on the road. As she builds confidence, both on her bike and off, she begins to find her way, ultimately undertaking an ambitious ride that leaves her strengthened, revitalized, and prepared for whatever comes next. 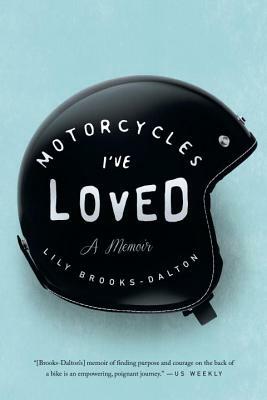 Honest and lyrical, raw and thoughtful, Motorcycles I’ve Loved is a bold portrait of one young woman’s empowering journey of independence and determination. Lily Brooks-Dalton was born and raised in southern Vermont. She is the author of the memoir, Motorcycles I've Loved, a finalist for the 2016 Oregon Book Award, and the forthcoming novel, Good Morning, Midnight.